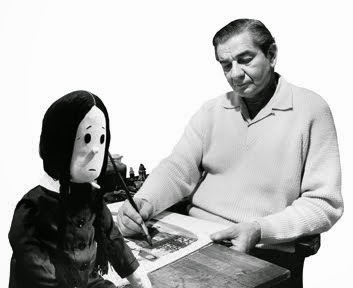 Charles Addams draws with a Wednesday doll nearby. 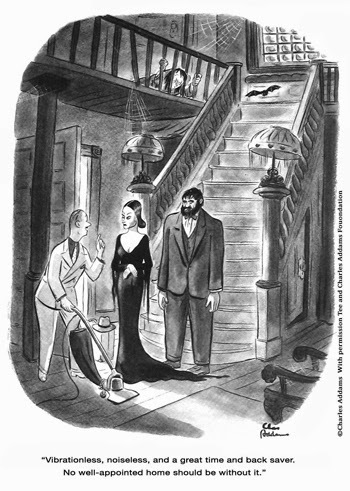 Charles Addams was a born cartoonist. Originally drawing cartoons for the Westfield High School newspaper, Addams eventually found himself at Manhattan’s Grand Central School of Art. During that period, he sent in a submission to The New Yorker, which was accepted and ran in the February 6, 1932 issue. Addams continued submitting to periodicals while working in the layout department of MacFadden Publications until a steady stream of work allowed him to quit his day job. The very first Addams Family strip. In 1937, Addams began what would be his longest running and most well-known creation: the Addams Family. 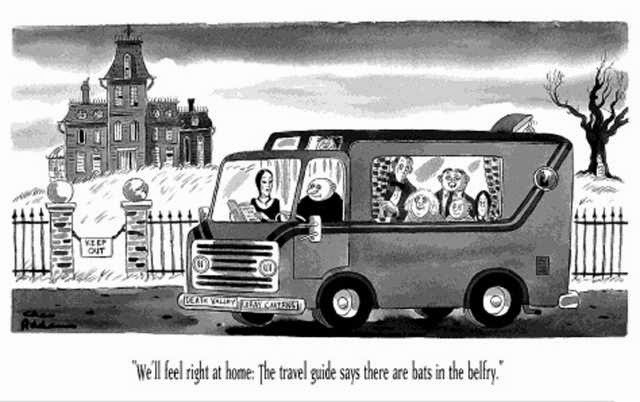 Running as single panel gags the Addams family initially was the antithesis of the typical American family. They were dark and relished in the macabre, engaging in acts of depravity and malicious, though mostly harmless, hijinks. Originally unnamed, the first Addamses featured were the stern and aloof matriarch, a rendering of Addams’ ideal woman that would come to be known as Morticia, and their faithful mute servant Lurch, who originally sported a beard. 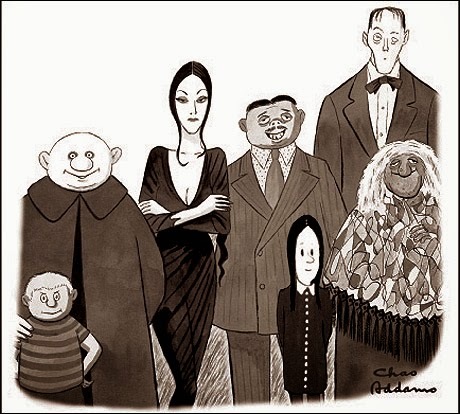 Gradually, other members of the family began to appear: Morticia’s husband Gomez, often depicted as reading in their creepy mansion with a tubby body and generally grotesque appearance; their son Pugsley, initially depicted as a young genius; their daughter Wednesday, who was her mother’s daughter in appearance and nature; the bald and cloaked Uncle Fester, a caricature of how Addams envisioned himself; Grandmama or Grandma Frump, a naive elder who spent many of her appearances doing witch-like activities, either with or without the rest of the family; and Thing, who was a figure that remained in the background watching the family and never seen fully. The Addamses appeared in 150 unrelated strips, only half of which appeared in The New Yorker during Addams’ tenure there until 1988. Meet the family (left to right): Pugsley, Fester, Morticia, Gomez, Wednesday, Lurch and Grandmama. In the 1960s, former NBC executive David Levy saw Addams’ book Homebodies, a collection of Addams’ cartoons, in a book store and snatched it up. Becoming enamored with the Addams Family, Levy contacted Addams and formed the basis of what would become the 1964 sitcom. It was at this point Addams finally had to refine the personalities and relationships of his characters and give them names. 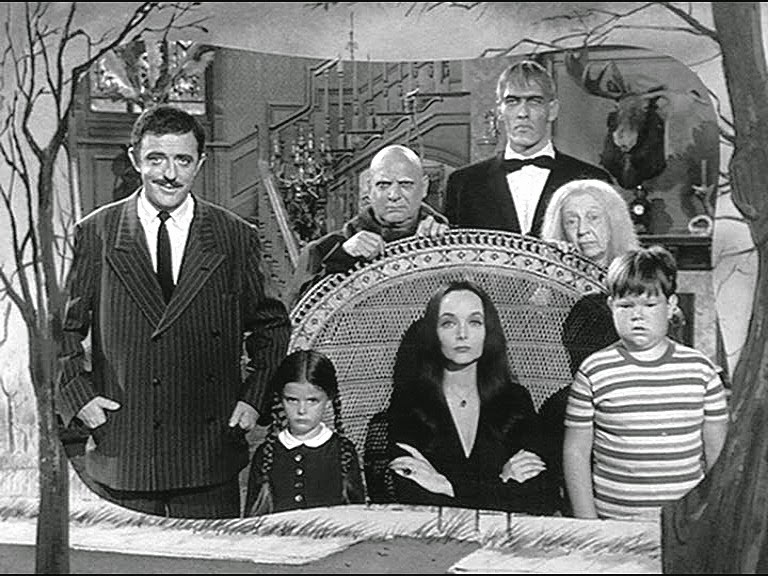 Addams chose Morticia (Carolyn Jones), Wednesday (Lisa Loring) after a line in the nursery rhyme “Monday’s Child,” Fester (Jackie Coogan), Eudora for Grandmama (Blossom Rock) and Lurch (Ted Cassidy). Addams wanted to call Pugsley (Ken Weatherwax) “Pubert,” but the executives asked him to change it. He also couldn’t decide between Gomez and Repelli (for repellent) for the patriarch, and left it up to actor John Astin to decide when he took the role (Astin, incidentally, was a fan of Addams’ strips). Cassidy also pulled double-duty as Thing (with Jack Voglin filling in when Cassidy had to be Lurch at the same time), now a disembodied hand an arm that traveled between boxes around the mansion. Meet the TV family (left to right): John Astin, Lisa Loring, Jackie Coogan, Carolyn Jones, Ted Cassidy, Blossom Rock and Ken Weatherwax. The series was radically different from the strip in that it was less macabre and more wacky. The eccentricities of the characters merged with their almost supernatural origins, which allowed them to engage in (and survive) otherwise fatal activities and have living inanimate objects around their house. Eccentric millionaire Gomez was madly in love with his refined and pale wife Morticia, stopping to passionately kiss her whenever she spoke in another language. They resided with their two children and Gomez’s mother, Grandmama, and Morticia’s Uncle Fester. The Addamses were oblivious as to how the world perceived them. Gomez liked to play with, and destroy, model trains, while Morticia spent a lot of time in her greenhouse tending to her pet African Strangler Cleopatra. Occasionally, other relatives would stop by the visit; such as Morticia’s sister Ophelia (also Jones), her mother Grandma Hester Frump (Margaret Hamilton), and the hat-wearing walking 3-foot pile of hair Cousin Itt (Felix Sillia and Roger Arroyo). 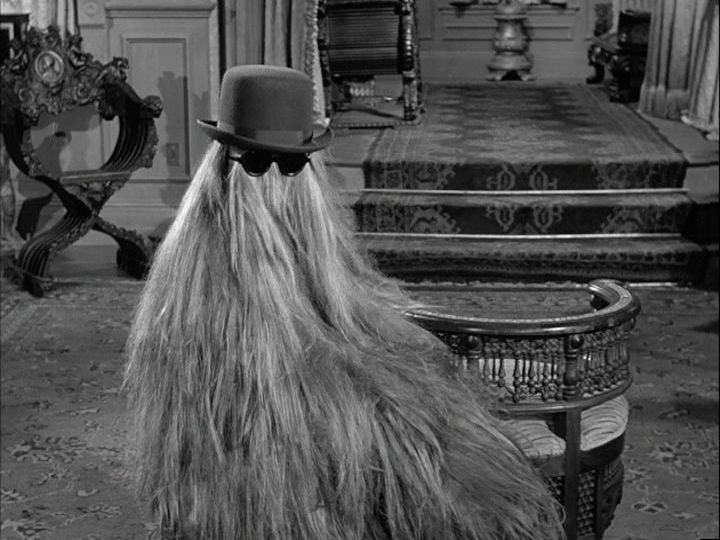 Cousin Itt was actually created by Levy, and later introduced into the strips by Addams. The Addams Family heads for browner pastures. The series lasted only two seasons, ending in 1966. Shortly after, reruns aired in syndication for the years following, finding new audiences and developing a growing interest in America’s kookiest family. As a result, it was decided to give the characters a chance at a new afterlife on Saturday mornings. OCTOBER IS HALLOWEEN MONTH ON SMF!